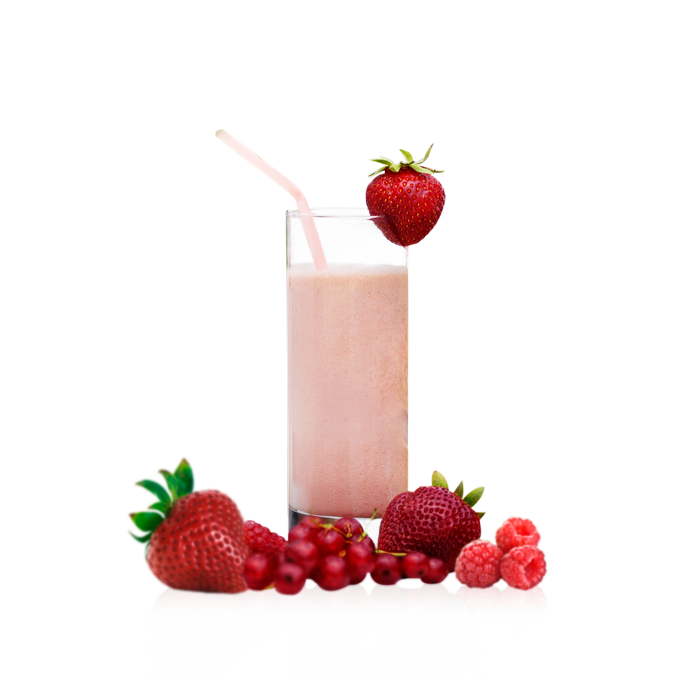 Cream liqueurs are usually aimed towards the woman. Nothing against that, and nothing wrong with a gentleman enjoying one either. But there’s that stigma that chocolate is a woman’s favourite love, after diamonds of course, and there is a liqueur out their to suit their every need – Mozart. Mozart Distillerie, a family run business, has produced traditional Austrian spirits in Salzburg since 1954 and Mozart liqueur was created in homage to the composer Wolfgang Amadeus Mozart and his native town Salzburg. The company was the first world-wide to succeeded in distilling chocolate using chocolate macerate made from cacao and vanilla. There are 5 expressions within the Mozart portfolio. The cocoas used within Mozart Gold is a mixture of the types Forastero (West Africa) and Trinitario (Carribean). Also containing fresh cream, conched dark chocolate from Belgium, genuine Bourbon-vanilla from Madagascar crystal sugar, and pure sugar cane distillate, the cocoa and the Bourbon vanilla are macerated in sugar cane alcohol (for Mozart Black, the cocoa and Bourbon vanilla are macerated for 30 days in sugarcane distillate, and then a certain part of the cocoa macerate is kept in oak barrels for two years). Dark chocolate, sugar, cocoa, and cream infused with cocoa butter are then blended in exact order. Mozart White on the other hand contains fresh cream, cocoa butter, real Bourbon vanilla from Madagascar crystal sugar and pure distillate from sugar cane. The fresh cream is skimmed and infused with cocoa butter whilst the Bourbon vanilla is macerated in fine distillate from cane sugar. This macerate is then melted together with crystal sugar, caramel, cream and cane sugar distillate. 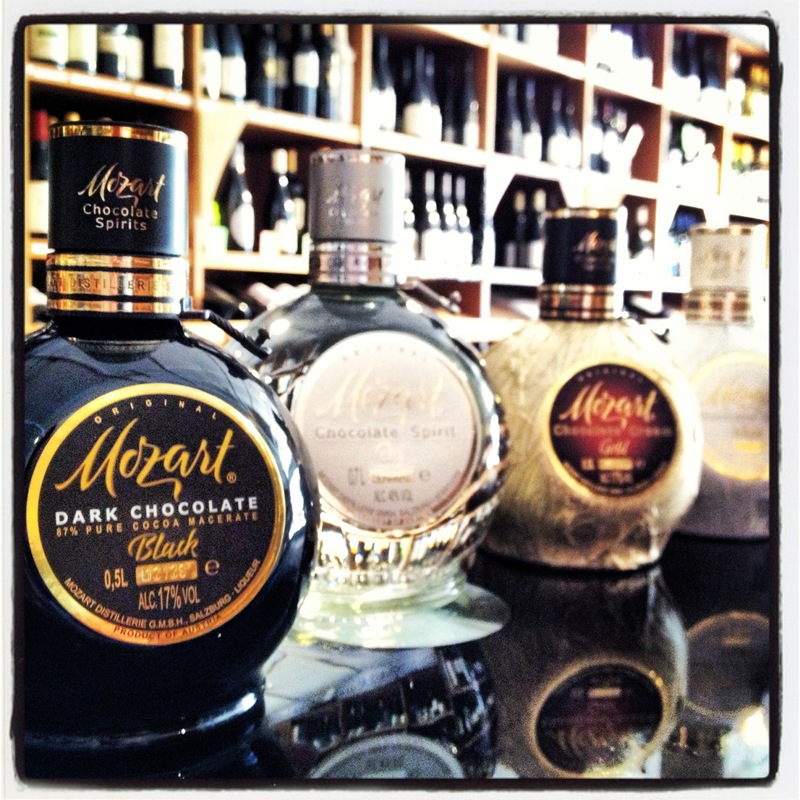 The Mozart Dry reflects the original XOCOLATL drink of the Aztecs rather than today’s chocolate, and is gained from the untreated raw materials cacao and vanilla. Special distillation equipment was engineered and as a result, a crystal clear produce is produced. Mozart Bitters are also available, adding extracts from spices like nutmeg and cloves as well as vanilla to barrel aged cocoa. Fresh, bold cream on the nose with a lingering chocolate scent. Sweet flavours of cream, caramel and white chocolate mix well on the palate to create a light, moorish finish. Deep vanilla and chocolate on the nose with a sweet flavour of each developing on the palate. Blends rather well and creates a moorish sensation. Lingers a little. Incredibly rich chocolate on the nose with sweetness slicing through. Rather light on the palate with a sharp hit of cocoa that starts a developing experience. Long, slightly dry with a fantastic warmth. Soft vanilla on the nose with dark cocoa slowly making its way through. Hit of sweet chocolate on the palate to begin with, hints of bourbon follows with a slightly bitter finish. The latest in the Mozart range to be released is the Mozart R.G. November this month sees the Mozart masterpiece or ‘Meisterstück’ hit your palates with a combination of cocoas from Ghana, gourmet chocolates from Belgium, Bourbon-vanilla from Madagascar, fresh cream, cocoa butter and distilled alcohol. 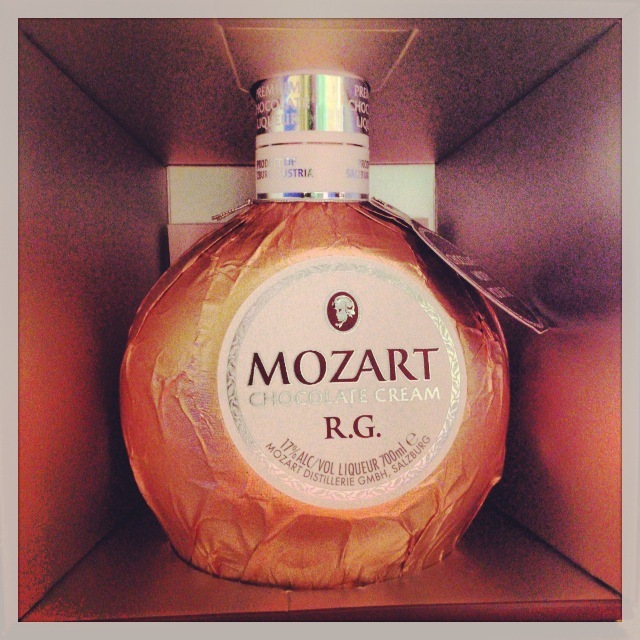 It might sound like your normal chocolate liqueur, but the Mozart R.G. is 20 years in the making as Master Distiller and Master Chocolatier Mr. Dietmar Fadinger has been searching to develop and create the perfect chocolate taste, whilst still being light and easy to drink. With this, he macerates the cocoa and alcohol together before refining it within Bourbon oak casks for a minimum of half a year. Soft caramel on the nose with a milk chocolate aroma coming through. A good hit of chocolate on the palate, with a more richer feel following alongside a slight vanilla flavour. A slightly dry finish, but the chocolate lingers for a long, long time. One of the best. Blend all the ingredients together within a blender and serve. Garnish with half a strawberry. 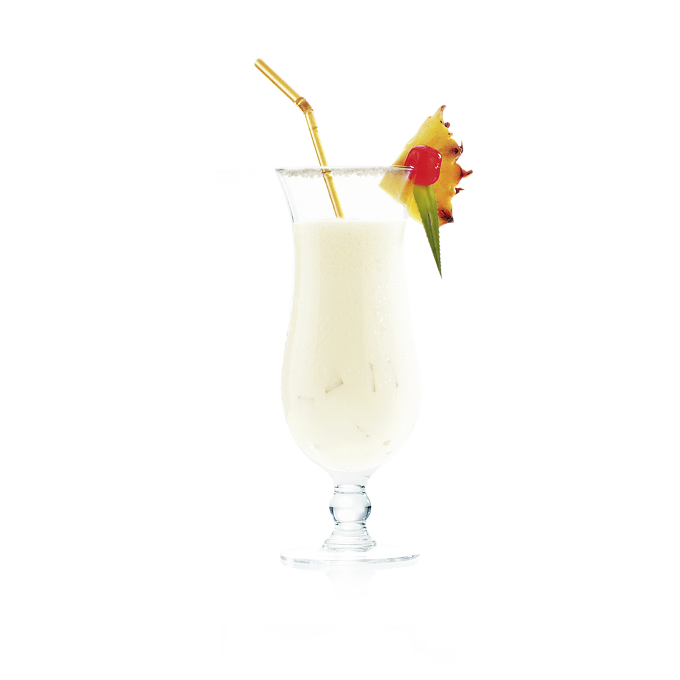 Blend all the ingredients together and garnish with coconut shaves on rim, pineapple wedge and a cocktail cherry. More and more bars are stocking the Mozart range due to the versatility of the brand. The new R.G. is a fantastic liqueur, and one that you could easily fall in love with next to a roaring fire. The gold and black are truly irresistible and the Chocolate Spirit is a cracking chocolate cocktail maker. Then again, imagine having them over ice cream? Or chocolate cake? One to enjoy for definite. nothing in getting you to where you want to be. see a rum and coke as your best pal during the holidays. If those solutions are too drastic, you might consider simply holding your phone at shoulder level when reading or texting. I was going to bed after 1 a.